The best digital storytelling app just got even better! 1. 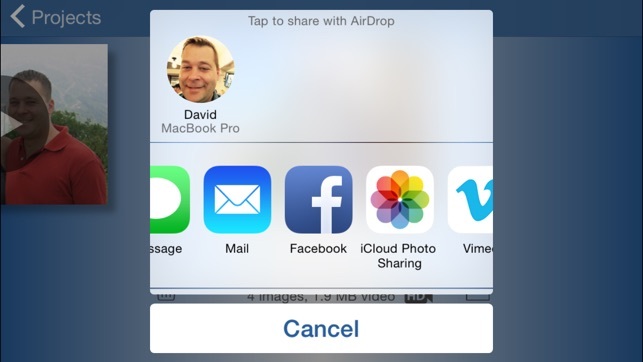 Add images from your photo library or snap new ones with your camera. 2. Arrange your photos however you would like. 3. 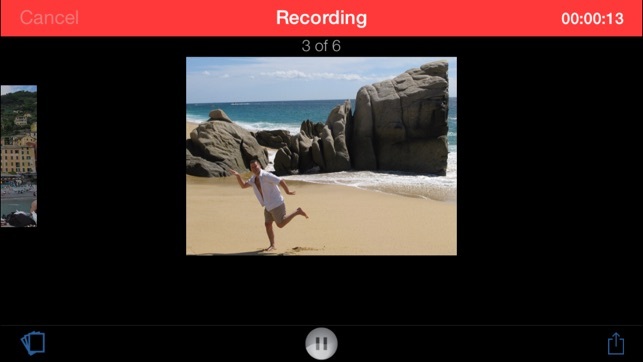 Record a voiceover narrating your images as you swipe through them. Once you are finished, you have an enhanced m4v movie with your images synchronized to your narration. You can share your recording with your family and friends. 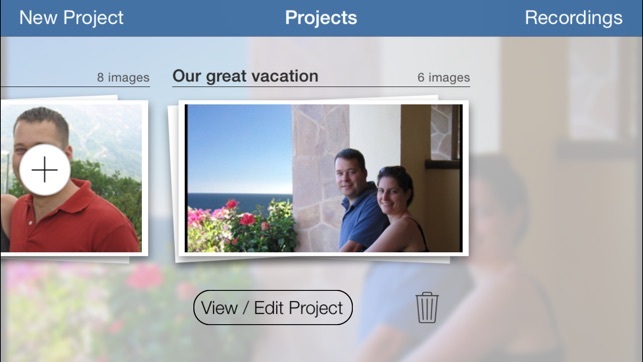 - Create and narrate custom photo slideshows. - Records your voice while you flip through your images. - Automatically synchronizes your images to the audio recording. - Present your stories on the big screen using video out while recording or to watch recordings. - Make .m4v movies of your images and narrations from your iPhone or iPod Touch or iPad. 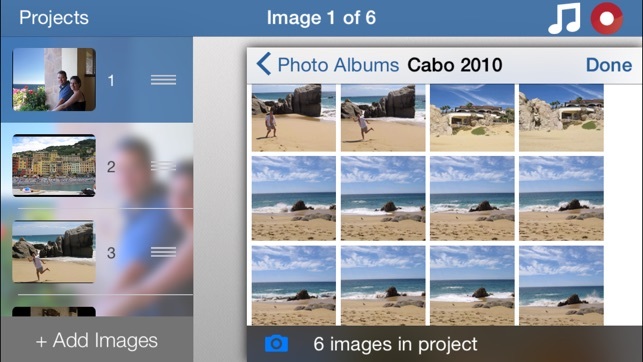 - Build slide shows with photos from photo albums, camera roll or built in camera. - Recordings processed right on your phone, no 3rd party service required! - Helping boyfriend study names/faces before meeting girlfriend's family. 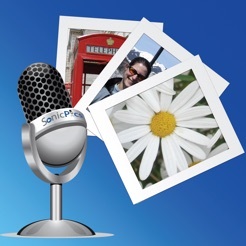 Make a great digital story now with SonicPics! FIXED - Issue that resulted in some recordings being too quiet. FIXED - Bug that resulted in a crash when deleting the last recording. FIXED - Issue that made images appear too small on the iPad. FIXED - Several minor bugs and user interface enhancements. SonicPics 2.5.1 requires iOS 7.1 or later. We don't feel comfortable interrupting your experience using SonicPics to ask for reviews, but if you are feeling generous with your time please take a moment and let us know what you think of it. If you enjoy using SonicPics, please take the time to give us a nice review: it really helps. Almost a total waste. You can't incorporate videos and images, only images. You only get one chance to record your slideshow because once you end it you can go back and edit. Also there are other quirks that make it obvious this project got dead-ended a while back before it was actually finished. I have searched and searched for a program that let me create a podcast style presentation on my iPhone. This is the best one I've found. I recently used it in my classroom for my students to create a narrated story. We scanned in their story pages and then they recorded the story. There are two features I would like to see added. First, for story pages, there is a lot of overlays when recording that prevent the students from reading straight from the scrren. They have to refer to their original story which then brings in the sound of them flipping their pages. If the overlays could be designed to not go over the actual image, this would be helpful. I would also love to see the option to have transition effects, like the look of a page turning and a fade into the next image effect. It would also be nice to have the option to add music. Overall, though, it fits the bill, and really is the best program out there for creating podcasts.